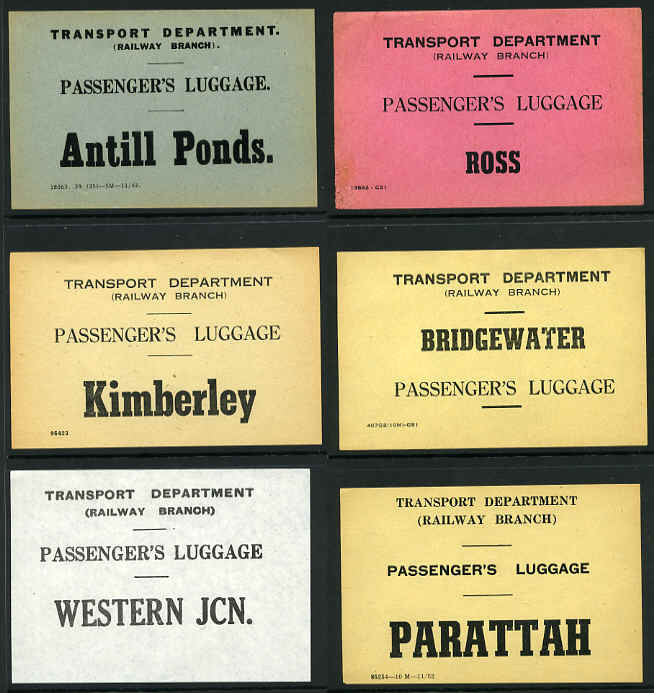 North Shore Steam Ferry Co. Ltd 1d Pink perforated ticket showing a ferry with some creasing and North Shore Steam Ferry Co. 20s Gentlemans Quarter Neutral Bay ticket. The North Shore Steam Ferry company operated from 1878 till 1899. 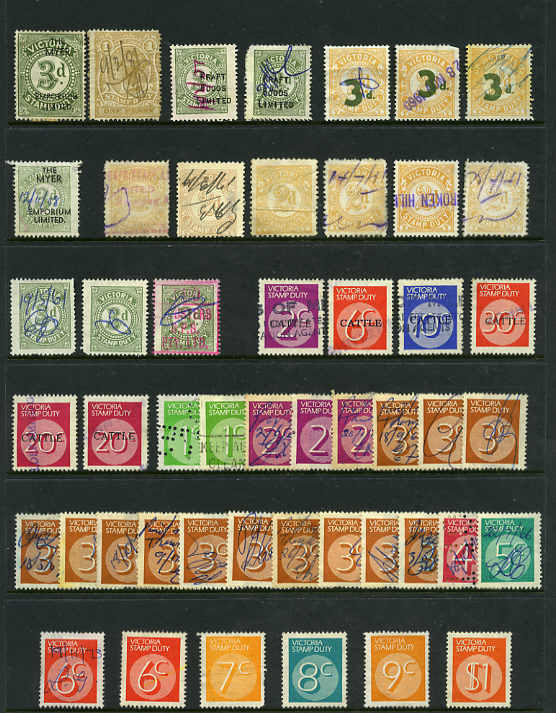 Selection of 230 mostly used Stamp Duty issues from Queen Victoria to 1960's with a good range of values to £1 including some perfins and several on piece. Considerable duplication of some values. 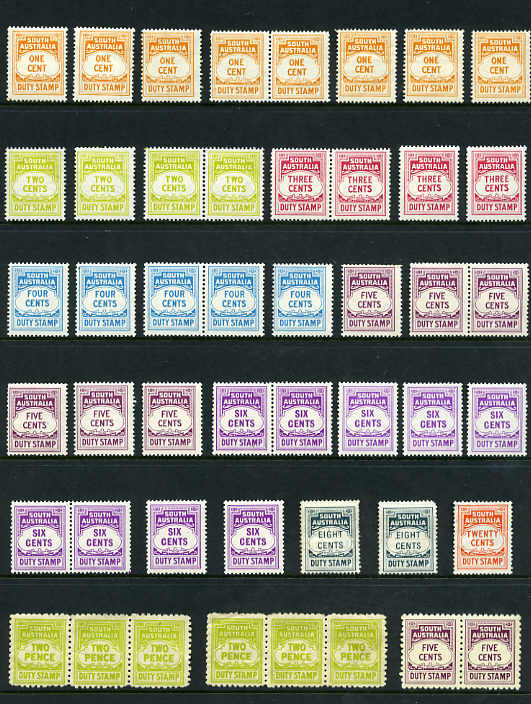 1930-1960 Selection of 27 mostly different impressed duty stamps with values to £70 fiscally used. 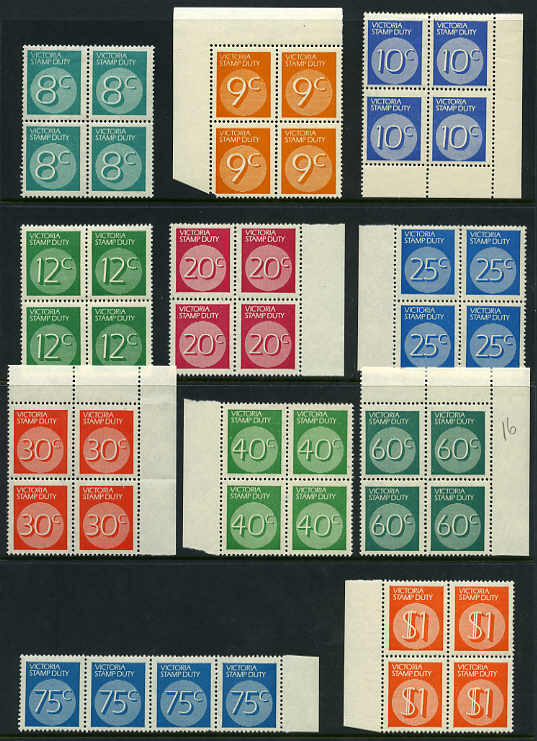 1938-58 Swine Stamp Duty set to 20/- value including both perfs of 1/- value and 1940 1d, 3d (2), 6d, 1/- and 5/- Cattle Stamp Duty used. Barefoot Catalogue Value $440.00. Also small range of Cinderella issues. 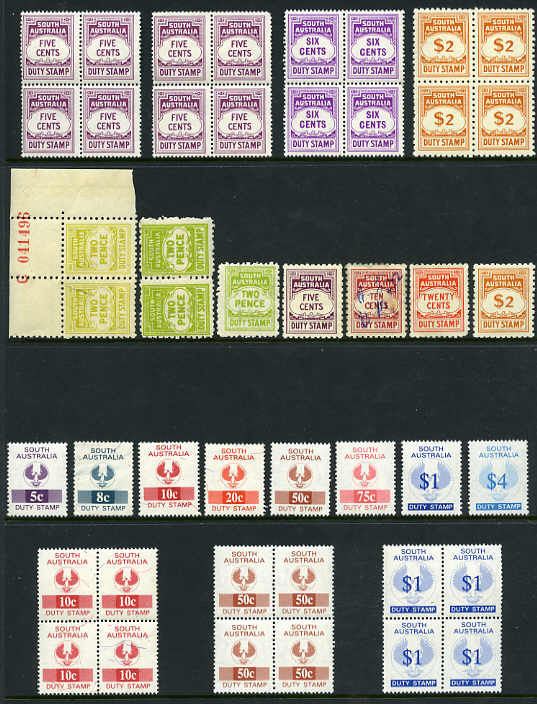 Accumulation of 186 mainly MUH Duty stamps from 1966 to 1979 including many duplicates, plus small range of earlier issues fiscally used on piece. 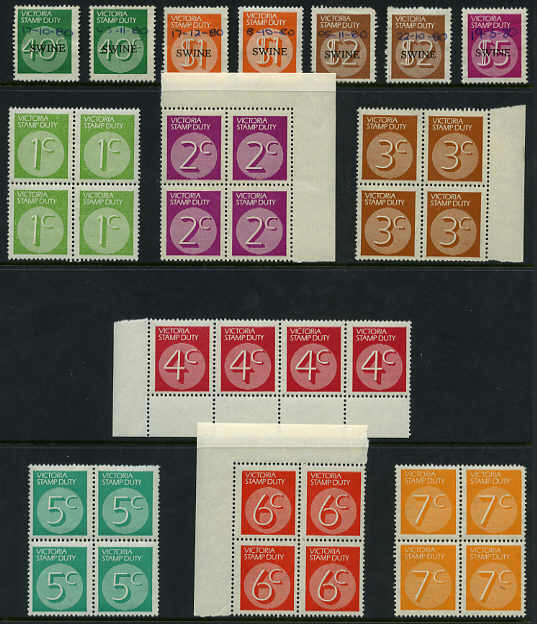 1966-70 1¢ Orange and 2¢ Olive-yellow sheets of 200 and 1¢ Orange block of 70, 3¢ Carmine block of 50, 4¢ Greenish Blue block of 60, 5¢ Purple block of 80 and 6¢ Bright Purple block of 50 perf 14½ x 13½ Stamp Duty issues MUH. Odd crease. 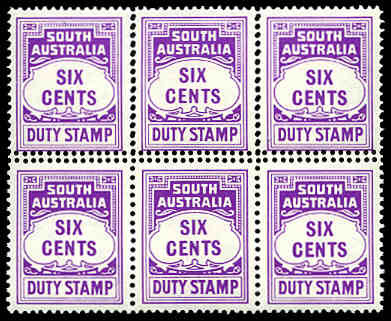 1970 6¢ Bright Purple perf 14½ x 13½ Stamp Duty issue in MUH block 6 with double perfs though centre. 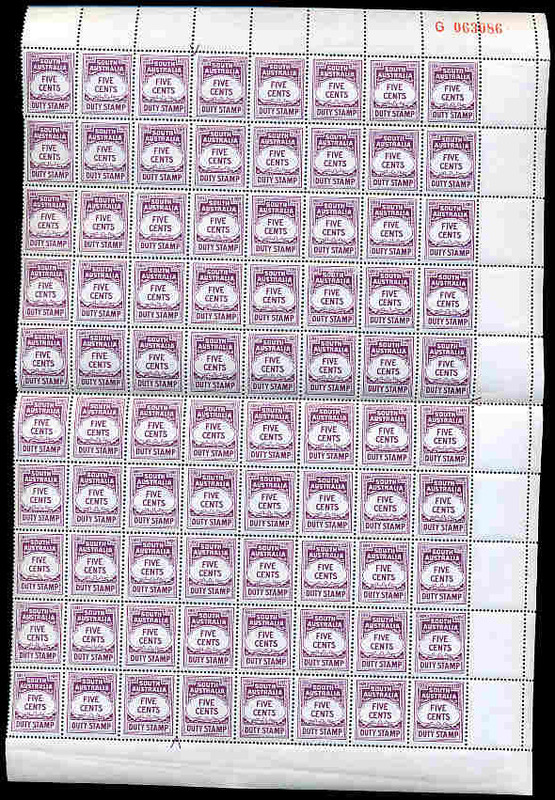 1970 6¢ Bright Purple perf 14½ x 13½ Stamp Duty issue in top right corner block 68 with double perfs affecting centre 2 horizontal rows of 34 stamps MUH. 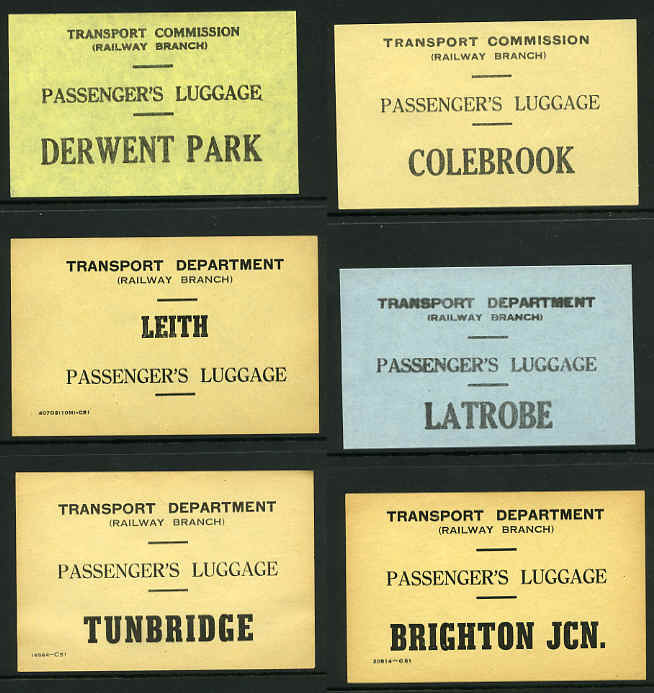 Accumulation of thousands of Blue Registration labels off paper from wide range of towns in shoebox. Some duplication, but good variety. 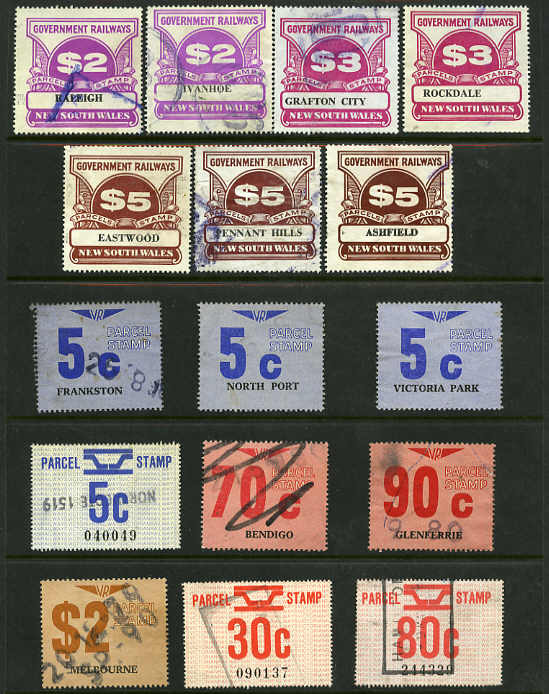 The Revenue Stamps of South Australia by Martin Walker, 2006 edition. The standard reference work covering these issues. 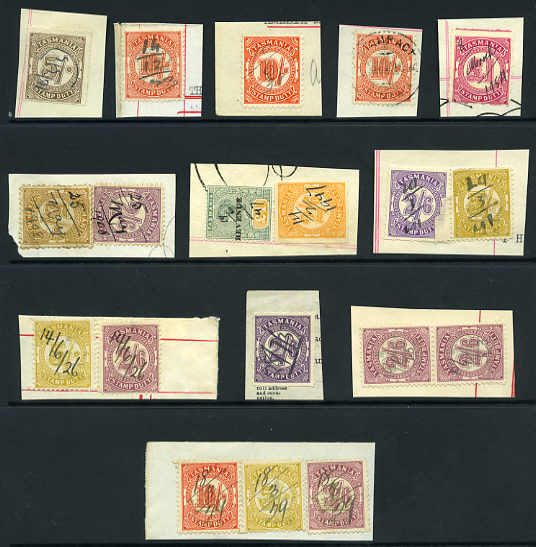 Selection of 48 Stamp Duty issues to £1 value on piece including perf and shade variations, better items and some duplication. 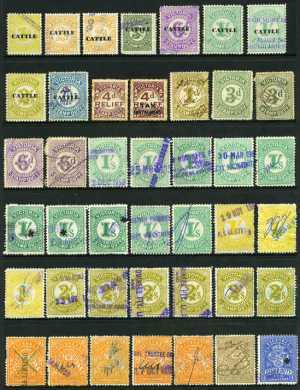 Noted 1931-33 7/6 Surcharge Platypus, 1900-1944 £1 Green and Yellow Queen Vic O/P Revenue and 1953 £1 Carmine-Lake. 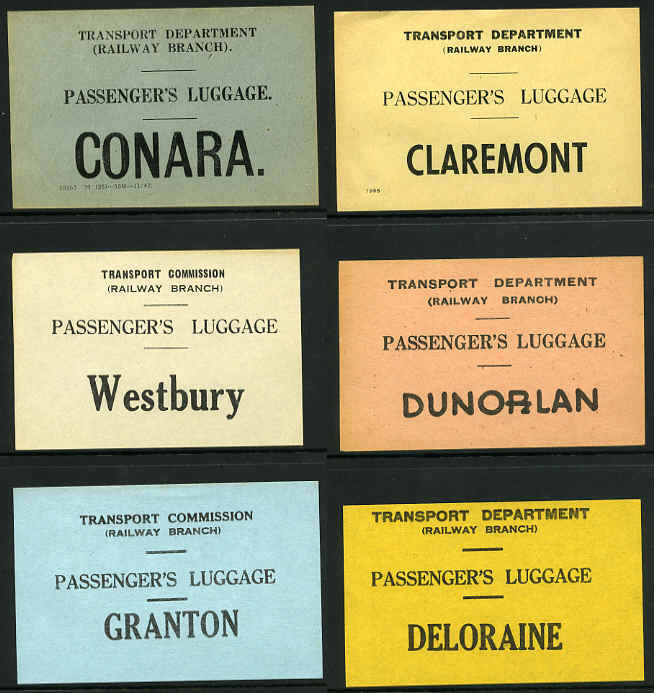 Transport Department Railway Branch selection of 24 different Passenger Luggage labels from a variety of towns. 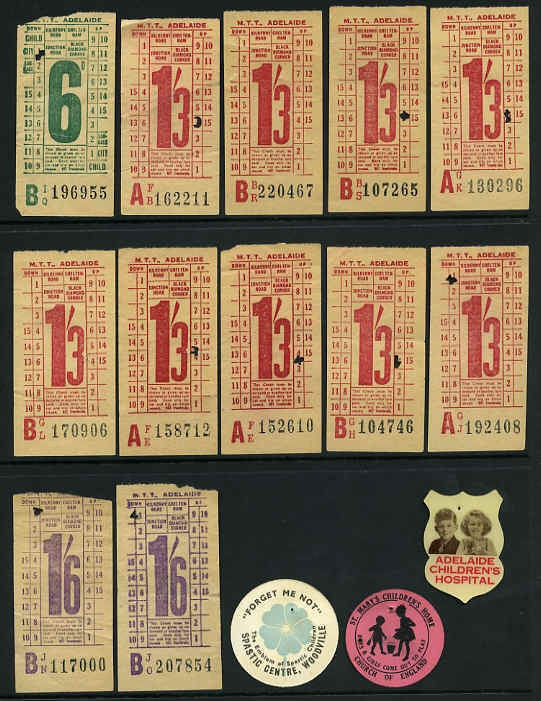 Also South Australia selection of 12 Pre-Decimal era bus ticket and 3 badges. 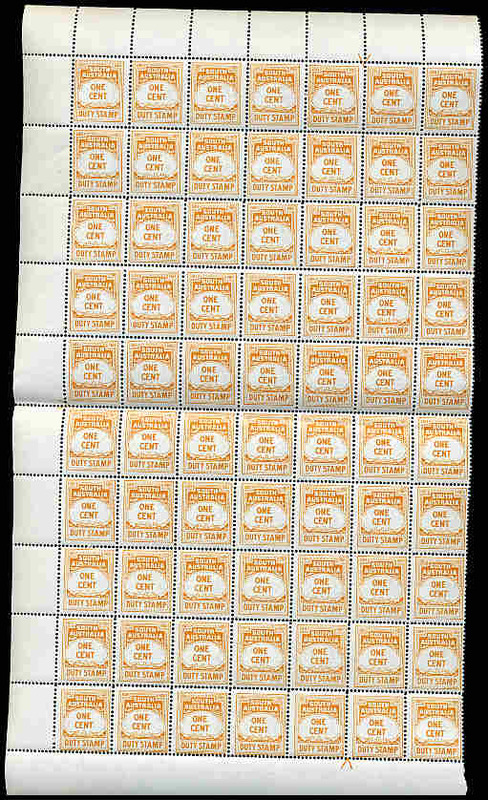 1966 Stamp Duty set to $10.00 value excluding 8¢ Lemon-Yellow MUH and 1¢, 2¢, 3¢, 4¢, 5¢, 15¢ and 20/c pen cancelled on piece with Treasury Hobart/State Taxation Branch/-7 May 1982 oval cachet and handwritten Samples Only - Do Not Use For Payment of Stamp Duty, plus small range of other issues. 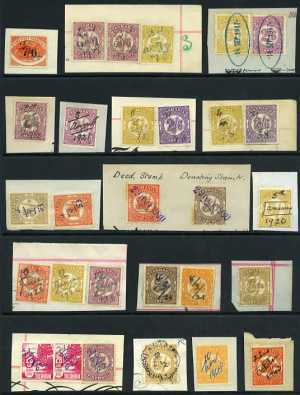 Selection of 60 used Stamp Duty issues to £2 value with some light duplication. Interesting range. 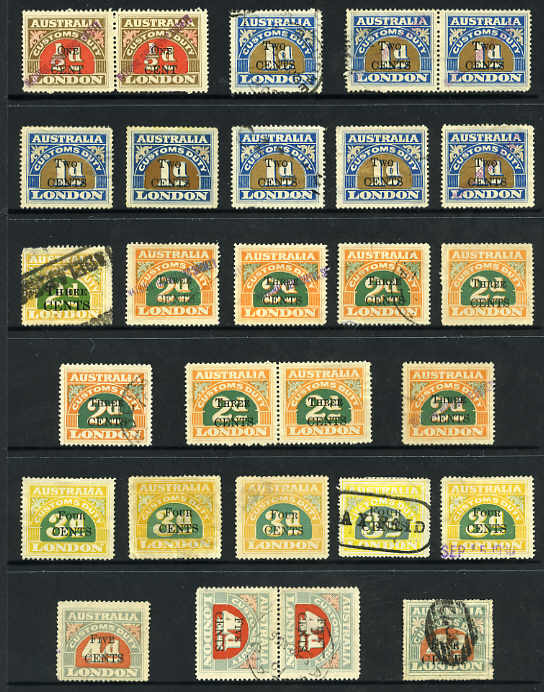 Selection of 224 MUH and used Stamp Duty issues from Queen Victoria to 1960's including Cattle and Swine overprint issues and good range of values to £1. 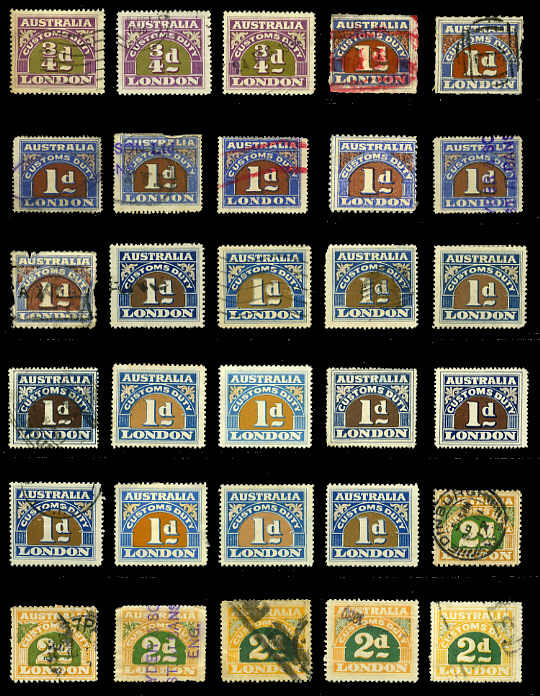 Considerable duplication of some values. 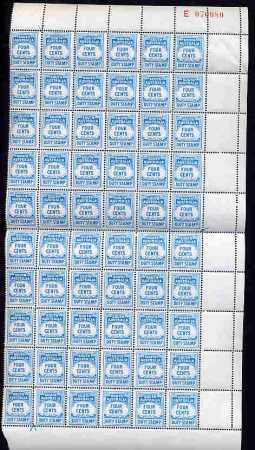 Victoria 2 Gallon Blue series B WWII era Motor Spirit Ration Ticket in fine tete beche block of 6. 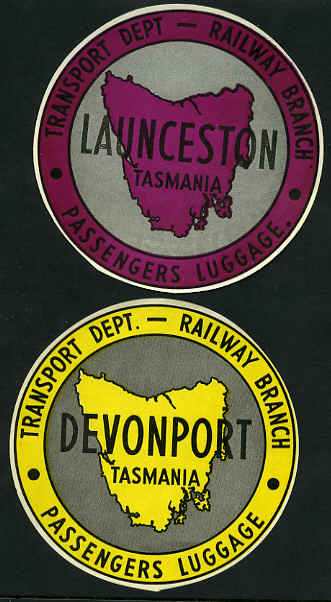 Also 1949 2 Gallon Black Victoria/Commonwealth of Australia Motor Spirit Ration Tickets 3, 2 with slight marks. 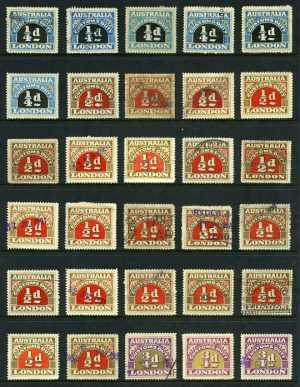 1936 South Australia Centenary Celebrations MUH sheet of 30 containing 9 different labels including 3 "Bradman" Cricket labels. 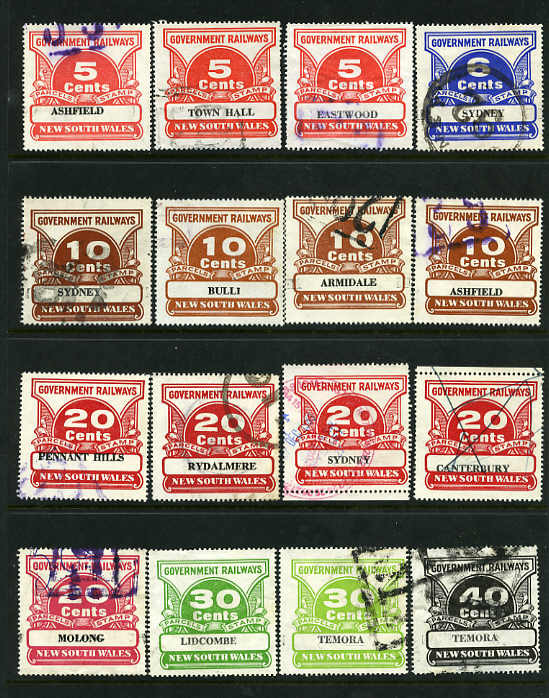 Superb condition and rare in complete sheets. 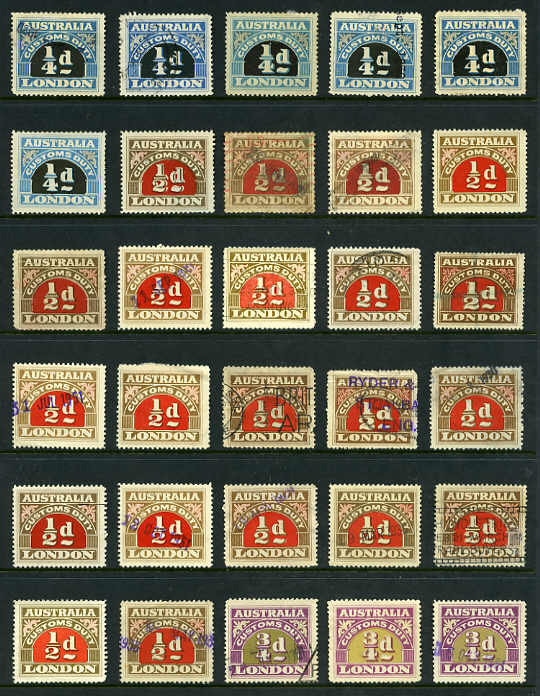 1938 Australia's 150th Anniversary Celebrations complete sheet of 49 labels MUH showing a variety of Australian scenes. 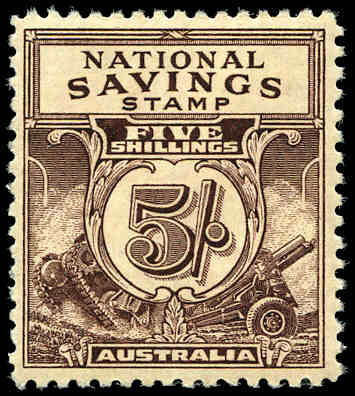 1940 5/- Brown WWII National Savings stamp MLH with light crease. 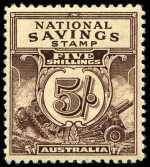 1940 5/- Brown WWII National Savings stamp (2) stuck in original folder. 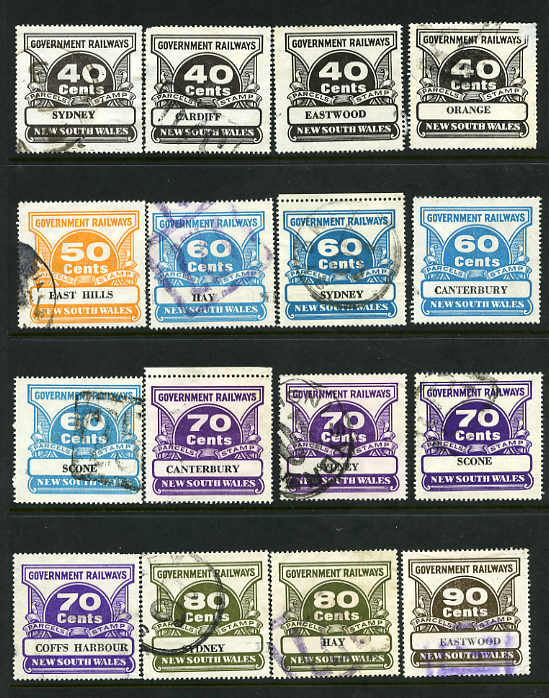 Collection of 303 Stamp Duty issues from a range of periods including many higher values and useful items with few duplicates. All States represented. Accumulation of 147 Customs Duty stamps including some with US currency overprints and many duplicates. Generally fine condition with some faults. Good variety. 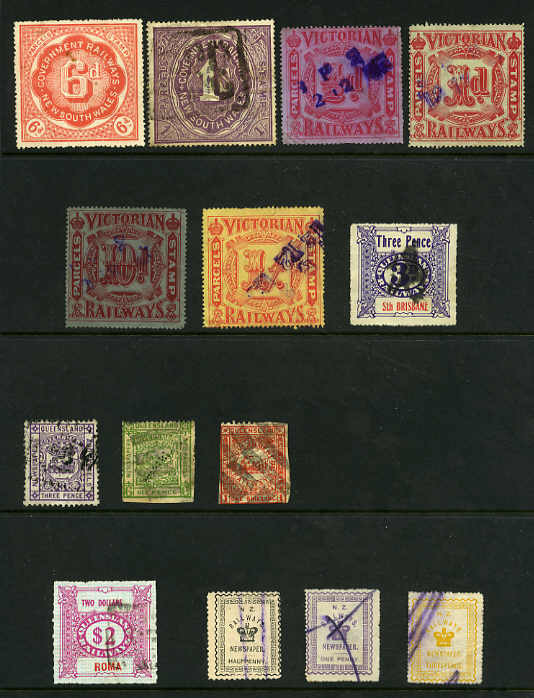 Collection of 94 mainly different Railway Parcel stamps from early to modern, comprising South Australia, Victoria, New South Wales and Queensland. Condition varies. 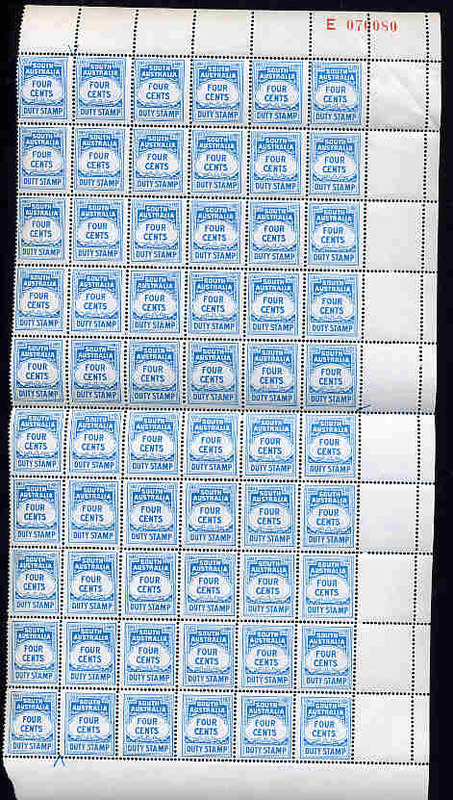 Accumulation of 1,008 Christmas seals from 1946 to 1980 in blocks and sheets including some Children's Hospital labels. Some creasing and odd fault. 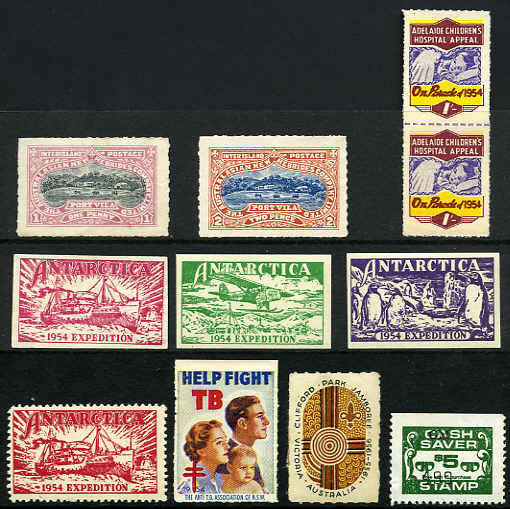 Selection of 19 different Tuberculosis labels from 1957 to 1979 in full sheets MUH. 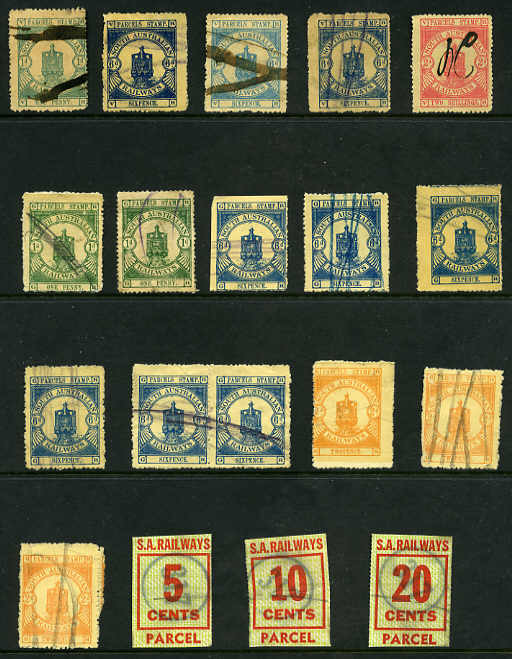 (930 stamps). 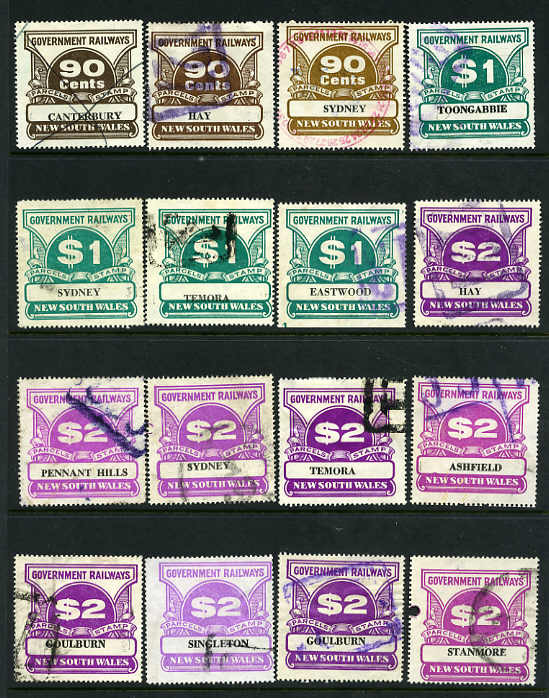 Selection of 193 State Government perfins perf OSNSW, GNSW, T, WA and VG on Kangaroo, KGV, Pre-Decimal and Decimal issues including some duplication. 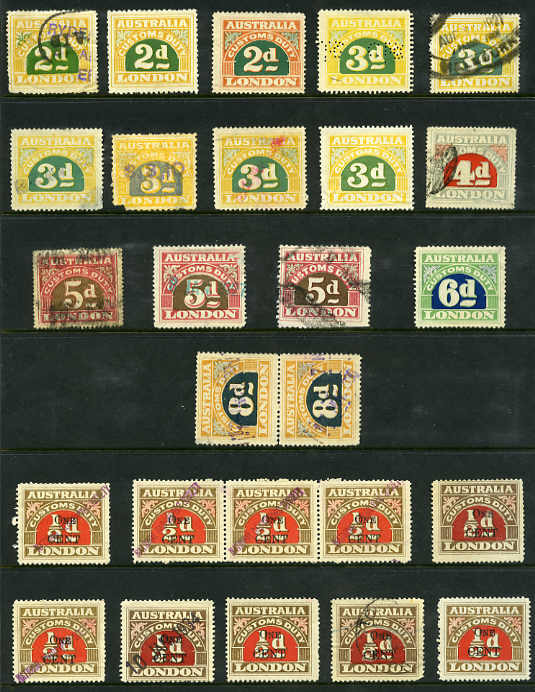 Noted 1913 4d Yellow-Orange Kangaroo perf T and 1915 4d Lemon-Yellow KGV perf OSNSW. 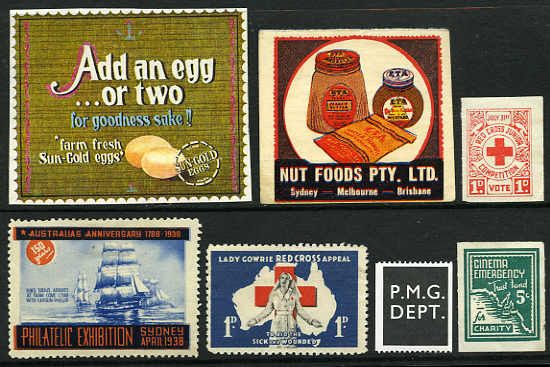 Accumulation of approximately 600 used Decimal stamps from 1966 to mid 1970's perforated T in small box. 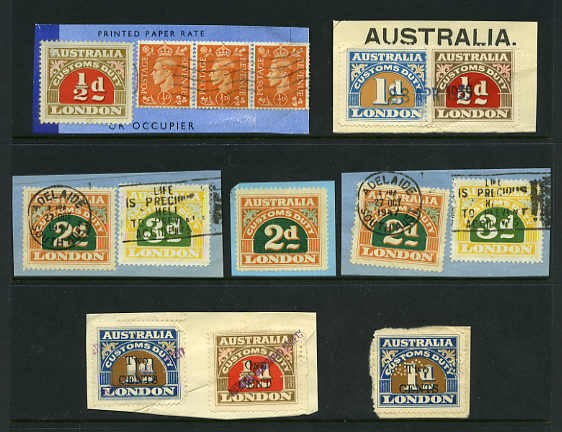 1986 (2), 1987 (2), 1988-89 (3), 1990 (4), 1991 (2), 1992 (3), 1993 (4) and 1994 Australian Wildlife Fund Koala Research miniature sheets including several O/P Specimen or signed by artists MUH. 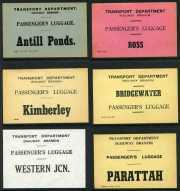 Also 1989 Australian National Parks $5.00 Plumed Whistling Duck MUH (7) plus 5 cancelled on Kakadu Park Tickets, 1990 $5.00 Chestnut Teal MUH (8) plus 1 cancelled on Kakadu Park Ticket, 1990 $8.00 on $5.00 Surcharge Chestnut Teal MUH, plus 1 cancelled on Kakadu Park Ticket, 1991-92 $8.00 Pacific Black Duck MUH (3) plus 1 cancelled on Kakadu Park Ticket, 1992-93 $10.00 Shoveler MUH (3), plus 1 cancelled on Kakadu Park Ticket, 1993-94 $10.00 Wood Duck MUH (2), plus 1 CTO and 1994-95 $10 Mountain Duck MUH, plus 2 imperforate proofs. 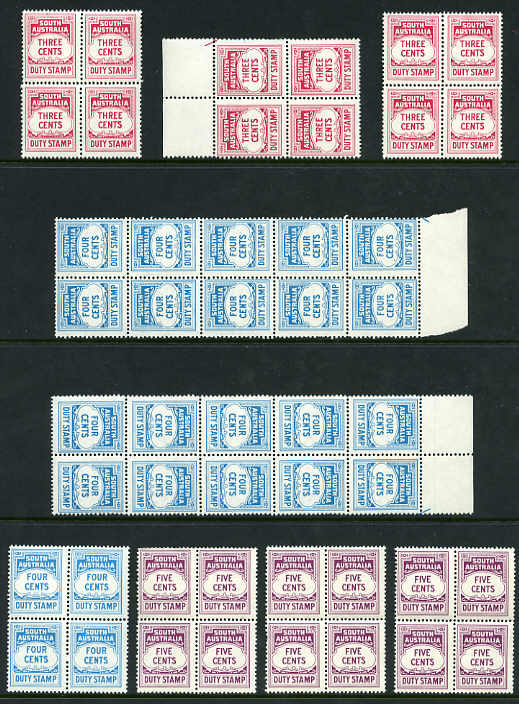 Several with Specimen or "Mandatory For Use" overprints. Face Value $359.00+. 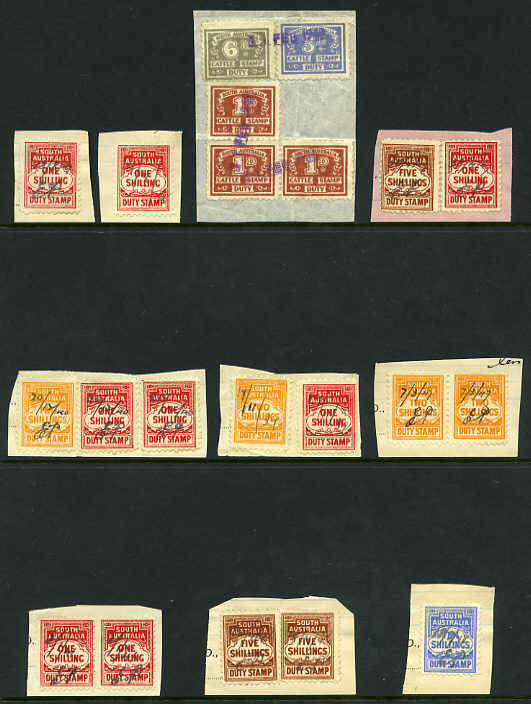 Selection of 158 used Duty stamps of various types including some interesting large State issues and some modest duplication. 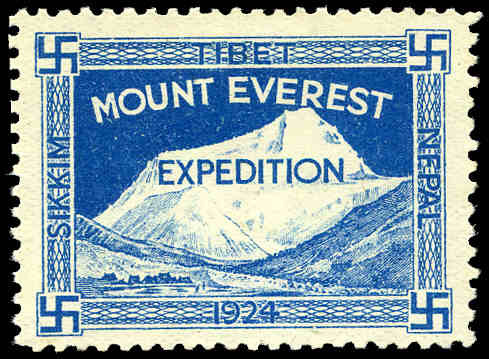 1924 Mount Everest Expedition label showing Mount Everest and base camp in blue mint without gum. Attractive. 1916 Jamaica War Stamp League Red Cross label O/P Jamaica in black mint without gum, plus Fiji 6d Red GSB Savings stamp MUH. 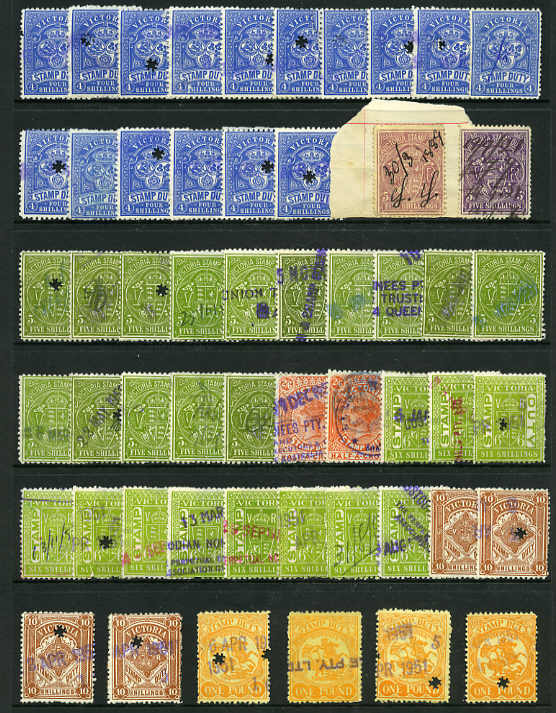 Collection of 214 mainly early mint and used Revenue, Cinderella, Railway and Telegraph items, plus small range of unissued French Colony Vichy Government issues in small stockbook. 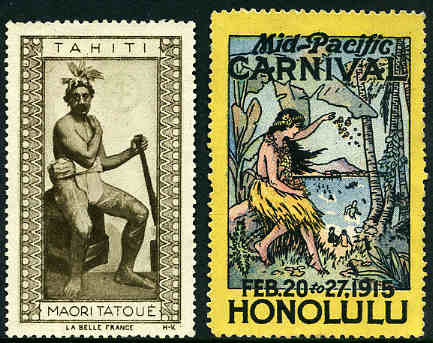 Honolulu Mid-Pacific Carnival Feb.20 to 27, 1915 poster stamp featuring Hawaiian hula girl, plus Tahiti label featuring Maori Tatoué, both mint without gum. Attractive. 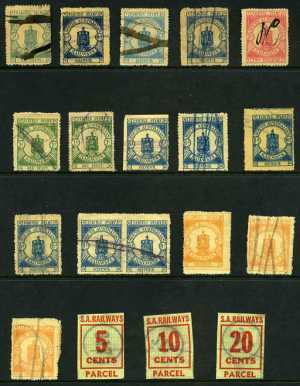 Collection of 250 mainly early mint and used Revenue, Cinderella and miscellaneous items in small stockbook. 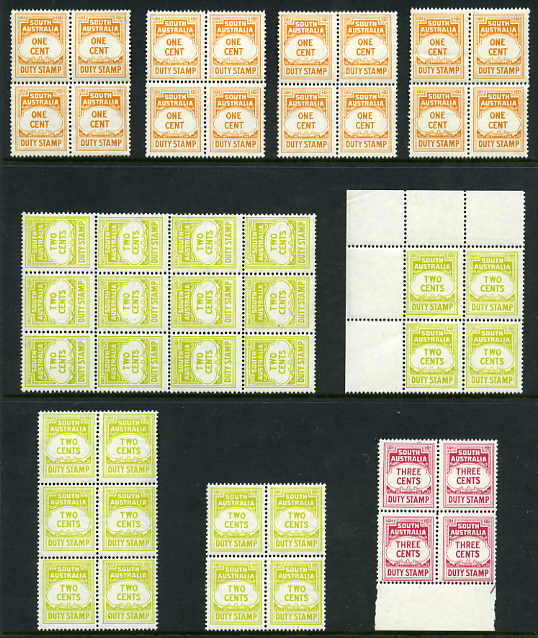 Accumulation of mint Tuberculosis labels from 1957 to 1984 comprising 698 stamps and 11 sheetlets from South Africa, Zimbabwe, Rhodesia, Denmark, Spain, Canada and Great Britain. Mainly in sheets and part sheets with odd fault. 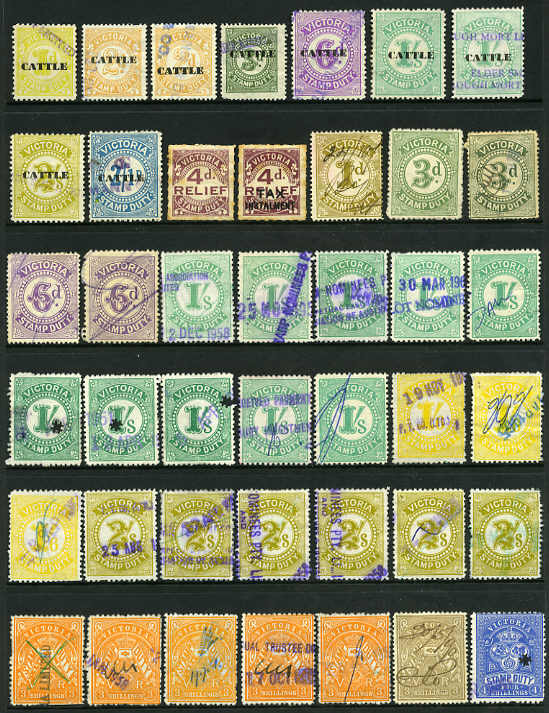 Collection of 372 mint and used Cinderella items from a wide range of countries and periods in small stockbook. Odd duplicate. 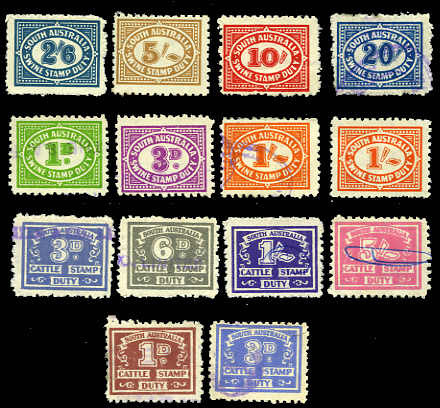 Collection of 245 mint and used Local and Cinderella items from a wide range of countries and periods on Hagner sheets. Odd duplicate. 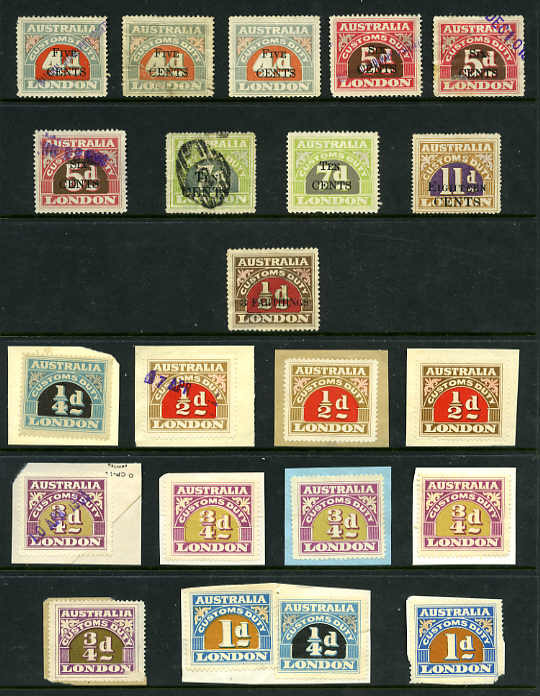 Collection of hundreds of mint and used Revenue stamps from a range of countries including some Australian States and numerous earlier issues in KEK stockbook.